Karen and I were recently visiting our friends’ new horse farm when I spotted a mare and her two young saddlebred foal companions (see photo) and decided I’d saunter over and say hello. Just wished I’d had some peppermints along. I started with the mare and took her stillness beneath my hand as consent. Of course, the foals wanted in on the action, too, though each time I’d reach out, ever so slowly, they’d flinch. In short, they hadn’t yet learned to trust, at least with regards to me. Trust, after all, is one of those life staples you must earn. In our human world we can be skittish, too, when it comes to trust, especially if memories linger in us of its betrayal as in a broken promise, lying, infidelity, irresponsibility, abandonment and, alas for children, poor parenting. It’s hard finding an antonym for trust, but deceit comes to mind. For the great Italian poet Dante, it was the worst of human short comings and he classified its several types into betrayal of family, friends, and nation. I wish I could say trust has the numbers, or upper hand, when it comes to humans, but I know better and so do many of you, and so I treasure it when, serendipity, I stumble on it. Being from New England and growing-up along its coast, I think then of lighthouses, rock solid, faithful sentries shredding the darkness with their rotating beams of pulsating light. I’ve always held the acute test of trust lies in the context of anonymity, or when we think no one’s watching. If someone runs stop signs, they probably take other short cuts from honor as well, making up their own rules that serve their interests. Deceit, if you will, is uppermost rooted in narcism, or satiating ourselves, damn our fellows. Deceit or fraud gets frequently collectivized in power and money conclaves, with near daily sightings of their misdeeds in government and banking. The aftermath, of course, is the bruising recession fallout for the rest of us, instigated by CEO greed and spendthrift bureaucrats that jeopardizes our future. I hurt when trust gets violated by manipulative charlatans. I want to believe the ad tells the truth or a doctor’s new book isn’t a facade for making money or that my local car dealer is giving me the best deal. I want to believe that my friend will keep his word, that my life partner will always love me and my children live honorably. If love is life’s consummate grace, without trust it will prove tenuous, or like a house built upon the sand, succumb to time’s erosion. Love may be life’s elixir, but to be trusted may be even better. Idealist that I am, I want to believe, not doubt; to embrace, not shun. Like the young foals, I don’t really want to flinch. This entry was posted in Lifestyle, Reflections and tagged deceit, fidelity, honesty, integrity, reliability, trust. Bookmark the permalink. 2 Responses to Trust me! Thank you! 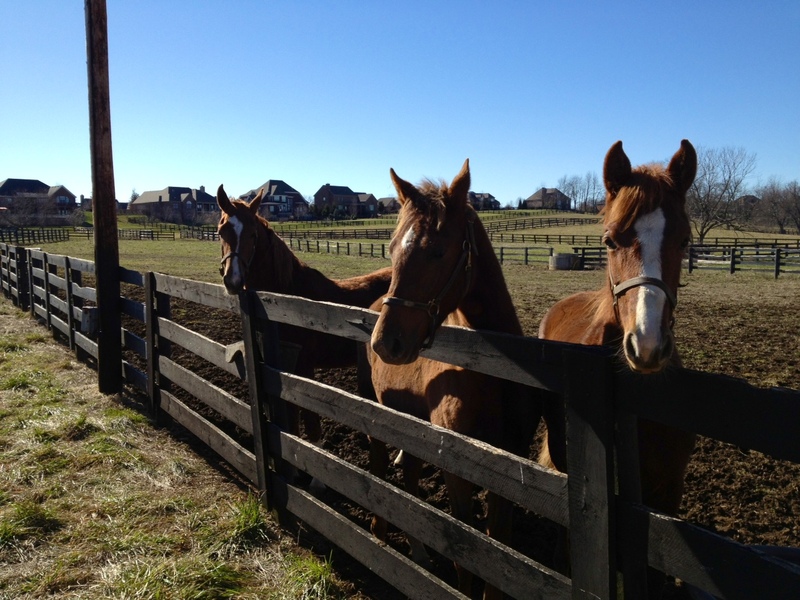 We have many beautiful horse farms here in the Bluegrass, so we’re very fortunate indeed!